If you’ve been on holiday or business trips to the UK then you’ll most likely have some British coins left over. As US banks won’t exchange British coins into USD you can be left with a hand full of change that’s not worth a cent in the USA. The great news is that here at Cash4Coins we’ll exchange British coins into USD! We specialise in changing foreign currency around the world and can turn those useless British coins back into US Dollars. We have many customers around the world and in particular the USA – just send us your Sterling currency and we’ll change it into USD. It’s really that easy… we’ll also pay directly into your bank account or via PayPal if required. Check out our customer comments section to see what our clients say about our service – you’ll also see a load of recommendations from our lovely customers in the USA. At Cash4Coins we help customers everyday from around the world to change their currency into a currency that they can use in their home country. Our service is quick, reliable and one that our customers return to time and time again. Become a Cash4Coins customer today! You may have one and two pence coins, five pence, ten pence, twenty and fifty pence coins as well as the higher one pound and two pound coins. 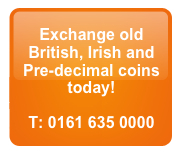 We’ll exchange any number of coins and we get sent a significant amount of one and two pound coins. To make it worthwhile posting the British coins to us why not get together with friends or work colleagues and collect their pound coins and pence and send to us for exchange. You can exchange British coins into USD and then use the money for yourself or alternatively you may want to donate the money to charity or a good cause. We recommend that you contact us before you send your coins so that we can advise on potential values before posting. We really want you to get the best value from our service and our team is always on hand to ensure that happens. We can exchange any currency too so if you have any other coins or notes just hanging around and not doing very much, we can assist. Turn that leftover money into USD that you can use! Many of our US customers come to the UK on regular business travel or holidays of a lifetime. Sometimes they don’t know when they may return to the UK again and have lots of UK currency that they cannot use. We can give you an excellent rate if you want to exchange British coins into USD so why not contact us today for a valuation. Remember, we can give you advice on postage from the States too so give us a call or use our contact form for an estimate. We really do want you to get the best value. Whatever you do don’t waste those sterling coins… exchange British coins into USD today!